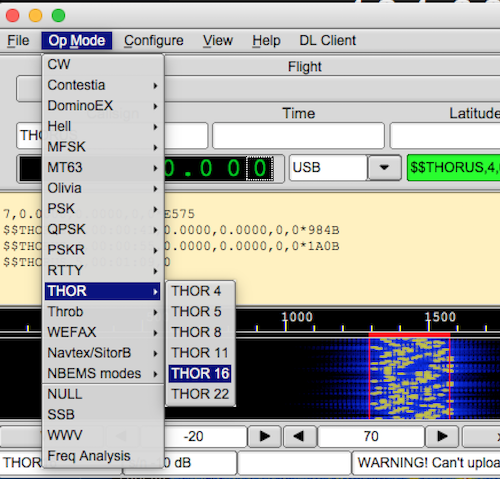 To help stations adapt to the new THOR16 signal, this coming Sunday there will be the opportunity for stations in the Adelaide metropolitan area to set up dl-fldigi as per the linked guide below and have a go receiving a higher-power version of the THOR16 signal. This will be broadcast from Mt Lofty Summit by Mark VK5QI. Mark will be on the VK5RSB 70cm repeater (439.900 -5MHz / 91.5Hz CTCSS) as ‘technical support’, to help assist setting up the software. The signal should be easily receivable from the Adelaide Metro area and some surrounds. This entry was posted in Club News, Project Horus by VK5GR. Bookmark the permalink.